Seagate's top line number bounced and profits took off in its third quarter as it made the most of increased nearline disk drive demand. The big question for us, the big question for everyone [about the nearline market]... is how long is it going to last and how big is the peak? Revenues for Q3 ended 30 March were $2.8bn, 4.8 per cent up on the same period a year ago, and net profits came in at $381m, up 96 per cent. The bulk of the revenue, $2.5bn, up 7 per cent year-on-year, came from disk drives. Just 7.8 per cent of turnover, a mere $217m, could be chalked up to enterprise systems, flash and other things – a grouping described by the firm as "non-hard disk drive revenues". And according to CFO Dave Morton in the earnings call, the firm shifted 13.6 per cent less of the non-hard disk stuff compared to Q3 of last year. The number crunching exec said the fall was "primarily due to the planned end of life of some legacy OEM cloud systems products and the divestiture of high-performance computing assets". He was referring to the HPC ClusterStor arrays sold to Cray. SSDs look to be somewhat an increasing focus for Seagate, with Morton declaring: "Silicon revenues were up a few percentage points year over year, and we continue to be bullish about our opportunities to leverage our supply agreement with the Toshiba Memory Corporation, as we invest in developing a broad-based silicon product portfolio in the SAS, SSD, PCIe, NVMe, consumer, and gaming markets for significant revenue growth and expanding margin contributions." 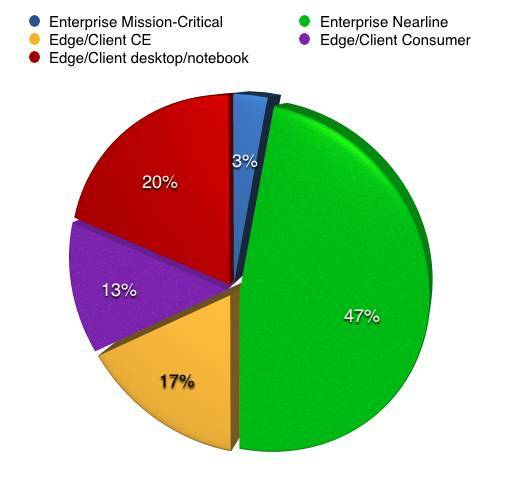 Analyst Robert Cihra, of Guggenheim Securities LLC, asked: "On the Enterprise SSD business, it's still quite small. I guess it was up a little bit year over year. But what does it take to build momentum there? Is a lot of that tied to the planned Toshiba deal? Is that the big change going forward, or what else can you do there to get that business growing?" Seagate top dog Dave Mosley responded: "One of the things that has hindered us in the past is the fact that we're always changing either the NAND supply from vendor to vendor or even from process node to process node inside of that vendor, and that's fairly disruptive... having longer-term visibility and a more stable, predictable supply chain is key to growth in that area." Seagate shipped 87.4EB of total disk capacity, up 34 per cent year-over-year, with average capacity of 2.4TB up 32 per cent annually, and an average selling price of $70.50, up 6 per cent annually. The spotlight fell on nearline drives, with 41.3 million units shipped, up 93 per cent year-on-year. All the other categories were smaller, and declined or were flat over the year. However, Morton said: "We've had year-over-year exabyte growth in the March quarter for nearly all end markets, including PC compute, consumer, gaming, and network-attached storage." Operating expenses fell 26 per cent year-on-year to $406m. Cash flow from operations was $558m, up 31 per cent year-on-year, and free cash flow was $489m, up 48 per cent year-on-year. "We are actively minimising our exposure to the sub-1TB client consumer and mission-critical 15K markets, as we believe these application workloads will move over time to either silicon-based memory or cloud storage, where we have or are developing portfolio offerings. In the March quarter, these products represented less than 8 per cent of consolidated revenue." The CFO said HAMR was on track to continue Seagate's nearline drive momentum. "We continue to make progress towards the introduction of our HAMR technology. This next-generation recording platform will open up a rich design space for high-capacity nearline drives that will push capacity points up 24TB per drive and beyond and offer great economic value for our customers. We anticipate launching our HAMR portfolio in volume in 2019." This nearline disk drive market is of intense interest to Seagate. CEO Mosley reckoned: "Specific to the nearline products, we share the perspective that we are in the early stages of a broad-based global cloud storage transformation." This suggests nearline storage is going to the public cloud and hyperscaler markets. He added: "The big question for us, the big question for everyone [about the nearline market]... is how long is it going to last and how big is the peak? And I think right now we just see strong demand through the back half of this calendar year." The firm expected revenues for the fourth quarter to be the same as this one – about $2.8bn, it said. CEO Mosley said: "Feedback from our largest enterprise customers in all regions indicates strong capacity demand will continue throughout the calendar year. In addition, we anticipate seasonal strength in our other markets, with particularly strong exabyte growth in edge markets in the second half." It seems to El Reg that having a "stable, predictable supply chain" is only a basic need; Seagate still has to devise and build product. We would imagine that, with demand high, it can basically build me-too-and-a-little-bit-better product and grow its NAND business significantly. But it will still be limited by not being a vertically integrated SSD vendor compared to Intel, Micron, Samsung, Toshiba and Western Digital. On that count Seagate is still lagging in its commitment to the NAND market. We believe that may be because it doesn't want to commit to the capital expense needed. Wells Fargo senior analyst Aaron Rakers wrote: "We think investors will continue to question Seagate's ability to gain traction in the SSD market (estimated sub-1 per cent share) vs. vertically integrated vendors, which collectively account for 95+ per cent of the total capacity shipped." He said disk-centric Seagate projected flash cannibalisation of hard drives affecting less than 8 per cent of its revenues. We think if it can make that up from buoyant nearline drive growth facilitated by heat-assisted magnetic recording (HAMR) and multi-actuator technology, Seagate might see no need to plough substantial cash into strengthening its NAND supply arrangements by getting into bed with a foundry owner.